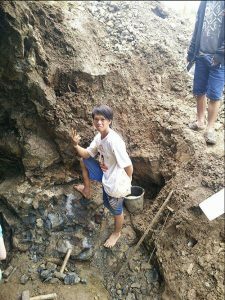 In 2016, I started to see Facebook posts of two unique materials that were coming out of Indonesia. One was really striking fossil coral. The other was the most stunning violet to deep-purple botryoidal agate that looked very much like clusters of grapes, which was being called “Manakarra grape agate”. I had never seen anything like it before. Both were being offered by Indonesian dealers on the Internet, but I wasn’t comfortable with sending cash to places unknown and to people I had never done business with. I hoped that dealers here in the Northwest might have run across specimens, but alas, that turned out not to be the case. This large slab of grape agate has just been pried free from a void. The lack of deep color and distinct botryoidal grape clusters makes it an inferior specimen. In February 2017, I headed to Tucson for the annual rock shows and made a goal of seeking out these new materials from dealers. As usual, there were multiple venues scattered all over the city, offering specimens of all sizes, shapes and descriptions from all over the world. 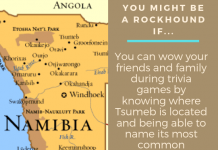 I searched diligently for the Indonesian fossil coral. 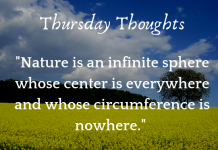 It’s more than likely it was there somewhere, but I was unable to locate any. I was more fortunate, however, in finding someone who had an impressive offering of the Manakarra botryoidal grape agate. This dealer, Lawrence Crouzen, was set up at an outdoor booth at the Rapa River venue. Spread out across several tables were absolutely spectacular specimens of this material, and to my surprise I found that it came in more than one color: off-white, gray, delicate lilac to deep purple, and even pastel green. Most of the orbs that formed the grapelike clusters had a velvety sheen that, as I found out later, came from an almost microscopic coating of druzy quartz. Lawrence was offering specimens in a range of sizes from individual orbs to large display pieces. It was priced from the gram to the kilogram. This stuff was amazing! I found out quickly that I couldn’t afford to purchase any specimens on a retired teacher’s income, but I needed to know its story. While talking with Lawrence and photographing some of his specimens, I found out that he lives on the Indonesian island of Bali and makes frequent treks to Sulawesi, which is a very large island near Borneo, to purchase the grape agate for export. 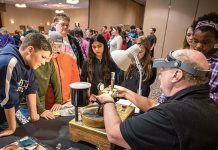 He said that he had a partner in the states, Bill Boss, who had a booth at the Pueblo Gem Show at Riverpark Inn, and suggested that I contact him for details about the agate and its discovery. I did so, and found Bill and his partner, Ellen, to be very congenial and willing to share the story of how Bill and Lawrence came upon this material. Bill and Lawrence provided much of the information for this article and numerous photos of the locality where the grape agate is being mined. Indonesia is a tropical country made up of approximately 18,000 islands that are part of a geologically very active and complex volcanic zone, where the Indo-Australian oceanic plate is being subducted beneath a thick, old continental crust. The islands are composed of a wide variety of volcanic rock types. I was told that the formation in which the Manakarra grape agate is found is on Sulawesi. 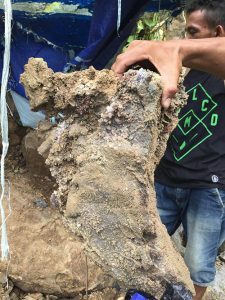 According to Bill and Lawrence, this unique material was first discovered on Manakarra Beach, which is midway along the coast of West Sulawesi. It was found as float that had been carried there by the streams that cascaded down from the jungle-covered mountains that lie inland from the coast. Prospectors followed these streams into the mountains and, with time and lots of effort, located the sources in the headwaters of the streams, situated on steep, jungle-covered slopes. The extent of the area currently being mined and explored is about 25 km2 (square kilometers). This view of an active pit shows five distinct andesite pillows, with two voids that contained agate. A rush followed, reminiscent of the gold rushes in California, Canada and Alaska, as local miners flooded into the area to search for the agate. There are no access roads, so all tools, food and supplies must be carried into the discovery area on foot, following the beds of the streams. 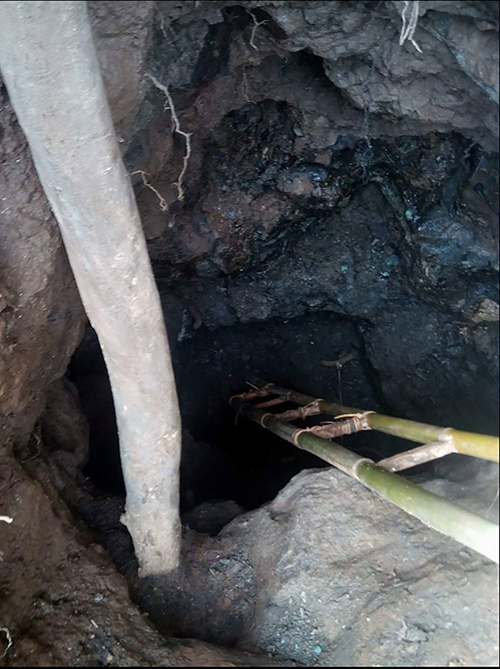 There are few developed trails to follow, and frequent, heavy rains can swell the rivers, causing flooding, which has claimed the lives of some miners. Lawrence and Bill told me that they have hiked into the area, and described the terrain as being very steep and densely covered with vegetation, and the climate as hot and very humid. It didn’t sound like my kind of adventure. The actual volcanic rock in which the agate is found consists of andesite pillow lava, which formed when molten basalt from Miocene volcanoes flowed into cold seawater. This happens frequently today on the big island of Hawaii, where basalt flows from the Kilauea volcano enter the ocean. I have also seen similar formations here in central Washington state, where the Columbia River flood basalts inundated lakes and other bodies of water during the Miocene epoch. Andesite lava behaves differently than basalt; it is more viscous due to its mineral makeup, so when it produced pillow formations on Sulawesi, voids were left between individual pillows. It is in these voids that the grape agate eventually formed. Tectonic interaction between the oceanic and continental plates subsequently thrust the andesite flows upward into the band of mountains that today form the west side of Sulawesi island. Mining for the grape agate is an arduous task. The hike to the discovery site, which is mostly uphill, can take several hours. There are few improved trails that lead to the outcrops containing the agate. 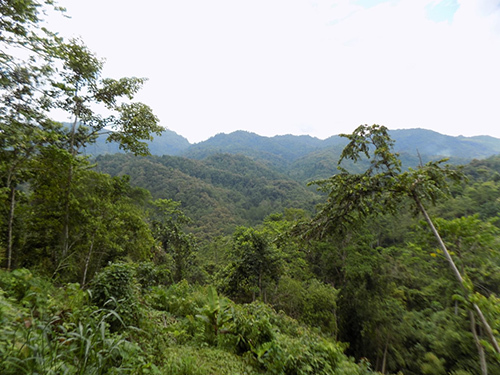 Once on the slopes, patches of thick jungle vegetation must be removed. Next, the soil must be removed to expose the weathering andesite bedrock that lies beneath in order to locate voids that contain the agate. The miners use steel rods to probe the ground in search of any open spaces. 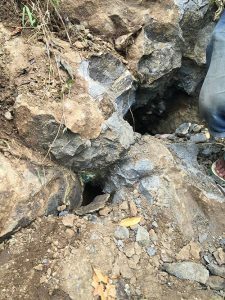 Once a likely area has been found, the miners use hand tools to pound away at the tough andesite, and try to follow seams in the hope that they will open up into voids where the agate is found coating the walls of the pillows. The structure of these agate sheets reminds me of the boxwork (thin blades of calcite that form a honeycomb pattern) I have observed in Wind Cave in South Dakota in that pieces of the formations project off the walls of the pillows and into the voids. Lawrence said the seams they follow are full of white to blue-gray clay. Removing the thin agate sheets that contain the orbs is a delicate process, during which many individual orbs and chunks with orbs break off. Not all the areas being explored have agate, and the quality varies from place to place and with how deep in the formation it is found. Material that has been exposed in the soil zone and the underlying weathered andesite tends to be poor, not having the vibrant colors that make grape agate so desirable. 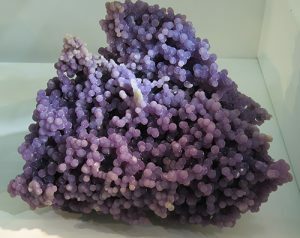 This grape agate specimen, on display at the Tucson Gem & Mineral Society® show, would make a killer addition to anyone’s collection. rock for better material is very difficult. 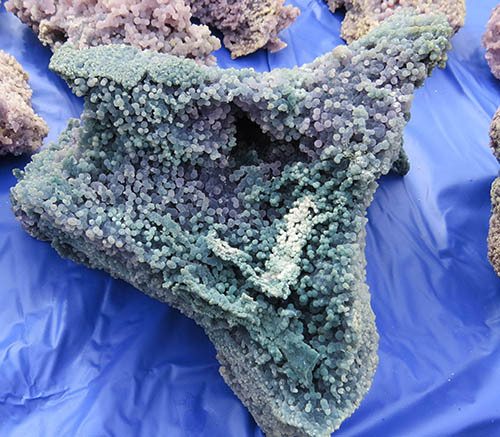 Once chunks of the botryoidal agate have been recovered, they are lightly cleaned so that the quality can be assessed, and then packed for the long hike back down the rivers to the trailhead, where it is loaded onto vehicles and transported to town. Some specimens are transported in backpacks, while larger specimens are hung from a pole in a sling and carried out by two miners. Accommodations at the mines are Spartan, consisting of elevated platforms covered with thatched roofs and/or plastic tarps. There is also no formal claiming process for the prospect pits the miners dig. When miners return to town, they just cover their excavations with logs and tarps or, if the pit isn’t producing, they just abandon it. 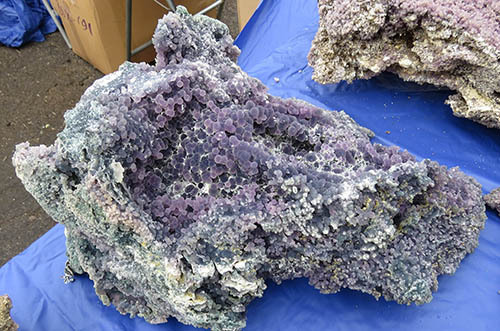 To date, tons of grape agate have been mined and transported to the costal towns, where it is either sold directly to buyers by the miners, or to brokers, who then find buyers. The prices being asked vary widely. Lawrence and Bill said that many larger pieces that resemble an animal or other object are quickly purchased by Chinese dealers, and that multiton lots are being purchased sight unseen. 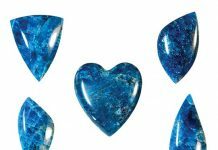 It seems to me that grape agate has limited use as a lapidary material, due to the delicate nature of the orbs; however, I have seen some jewelry artists shaping and setting striking freeform cabs made from the ma­terial. I have also seen individual orbs being drilled and strung, much like one would do with pearls. It looks like most of the agate is being sold as specimens, though. The pieces I have seen would make great additions to any collection. As of this writing, I know of no formal survey being done to determine the extent of the formation in which the agate is being found, either in geographic area or depth. Due to the toughness of the andesite host rock and the remote location of the deposit, it is unlikely that hand mining will exhaust the deposit anytime soon. That is good news for anyone who is interested in acquiring this beautiful material. As miners chase seams, they need improvised bamboo ladders to access the deepening tunnels, as some of the pits can extend several meters into the andesite. Hand sledges and steel wedges are used to excavate the tough andesite. Note the lack of shoes and gloves and the steel probing rods propped against the pit wall. Some of the specimens at Lawrence Crouzen’s booth had a combination of violet and pleasing green shades. The jungle-covered slopes of the mountains on Sulawesi make accessing the grape agate deposit very difficult.